For years, bus and BRT control centres have regaled visitors with displays showing impressive real-time information about many aspects of public transport and urban transport systems. One of the many impressive displays shows the real-time location of buses along a route. Yet this information is hardly ever displayed to passengers waiting at bus stops. Seoul has a newly installed system which displays the number of minutes until the next bus arrives, and scrolls through coming bus arrivals, but does not show the position of several buses along the same route. Guangzhou has a world class traffic control centre and BRT control centre, but provides no real time information at bus stops and only rudimentary real-time information at BRT stations. In the BRT systems documented at www.brtdata.net, nearly all have impressive traffic control centres with real-time location of all buses along a particular route, but none of them provide that information to passengers. Showing the location of all buses along a route is potentially far more useful to passengers than just knowing how far away the next bus is. A technology and advertising firm in Jiangxi Province has finally bridged this gap between control centre and public information display, now providing real-time information of the position of buses along routes in several cities, including Ji'an, where Far East Mobility is currently planning a Bus Rapid Transit system as part of an Asian Development Bank project. The traffic control centre in Seoul, with photos above from 2016, provides real-time bus location in an easy-to-read visual format -- to control centre personnel. The newly installed citywide bus stop information displays for passengers provides only a scrolling text display of the estimated minutes until the next bus arrives. The information is easier and faster to read in the control centre layout, though the text-only diplay is more compact. Guangzhou has an impressive control centre with real-time bus location information, but provides no real-time information at bus stops. Jiangxi Huaxing Information Industry Co., Ltd (Huaxing), incorporated in Jiangxi's capital city of Nanchang in 2007, has developed and installed the electronic displays at bus stops in 32 cities according to its website. The electronic stops in Ji'an were installed starting from May 2016, and are now installed in 80 stops around the city. The Ji'an bus company plans to have 160 of the stops installed as phase 1 of the project. The phase 1 installation is focused on higher demand bus stops with greater advertising revenue potential. The electronic displays are installed under a BOT contract between Huaxing and the muncipal Ji'an Bus Company. The electronic displays are installed on a build-operate-transfer (BOT) contract between Huaxing and the muncipal Ji'an Bus Company. The bus company provides the real-time bus operation data, and Huaxing pays the full cost of bus stop construction, operation and maintenance over a ten-year period, in return for advertising rights over this period. After ten years, the bus stop and advertising rights revert to bus company ownership. According to Huaxing, installation costs 100,000 yuan (US$14,600) for each bus stop, and the annual operation and maintenance cost is 20,000 yuan (around $2,900) per stop. Many advertising-supported ITS systems at bus stops work for a short period of time, if at all, and then fail. The advertising functions continue to work, but the real-time functionality is either inaccurate or is not maintained. Eventually the system is demolished. The system in Ji'an has now been working for more than a year, and, so far at least, continues to work well. The presentation of information at the Ji'an stops is superior to other displays we have seen. The electronic displays present a hierarchy of information in which the current stop and the real-time bus location for the route of interest to the passenger can be seen at a quick glance. 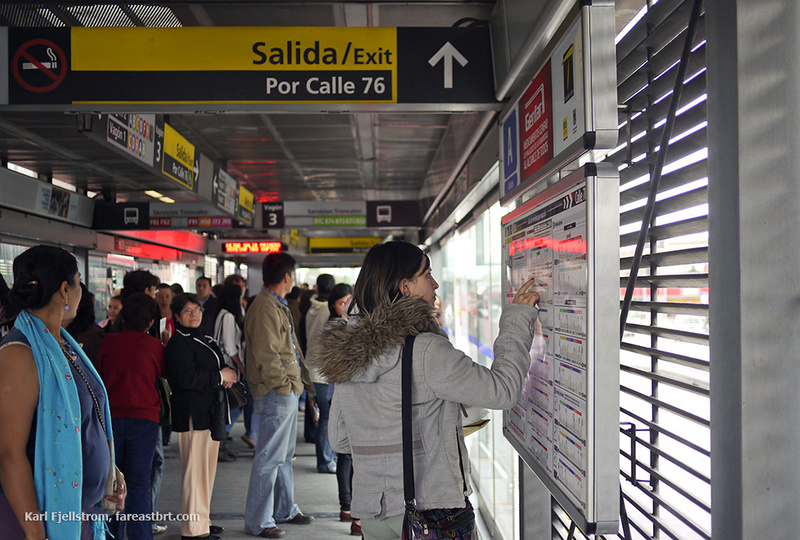 For passengers wanting more information, the real-time signs show the stops along the route, the information for other routes, the bus fare, and other information. The key information about how far away the next bus is, is also presented in large display next to the bus route number, so passengers do not need to even look at the details of the stops along the route, if they prefer not to. The use of colours and fonts is thoughtful and well-implemented. For example, the indicator showing how many stops the next bus is away is in yellow, large font, enabling very quick recognition. The current bus stop has a red background shading which is also very quick and easy to recognize and read. The advertising is large and prominent - perhaps too large, and below eye level for some routes - but at least the bus route information is still readily discernible. Rather than providing the bus route information as a separate display element, the passenger information is included in the same high quality screen used for the display advertising. This LCD screen has a brightness not less than 1500cd and supports high resolution 1080p display. Importantly, the fact that the passenger information uses the same screen as the advertising should ensure that it remains in good working order. Far East Mobility's field observations in June 2017 suggest that the system is highly accurate in terms of the real-time bus location, and achieves a very high level of coverage of buses and routes. Many other such systems are inaccurate or incomplete in coverage of buses and routes. Real-time bus location display at a bus stop in Jinggangshan Avenue in Ji'an, June 2017. In China and elsewhere there are mobile Apps which provide real-time location information - Chelaile, for example, is perhaps the best - but this requires opening the App and searching for the information with a smart phone and internet connection. Showing the location of all buses along a route is potentially far more useful to passengers than just knowing how far away (in minutes or bus stops) the next bus is. This information can help alleviate bus bunching, because if passengers see that there are two 'bunched' buses coming close together, and see that the first bus is crowded, they can wait for the bus following close behind. This following bus is likely to be less crowded, and the additional boarding time in the second bus will tend to re-establish a gap between the two buses, alleviating bus bunching along the route. The fact that the passenger information uses the same screen as the advertising should ensure that it remains in good working order. 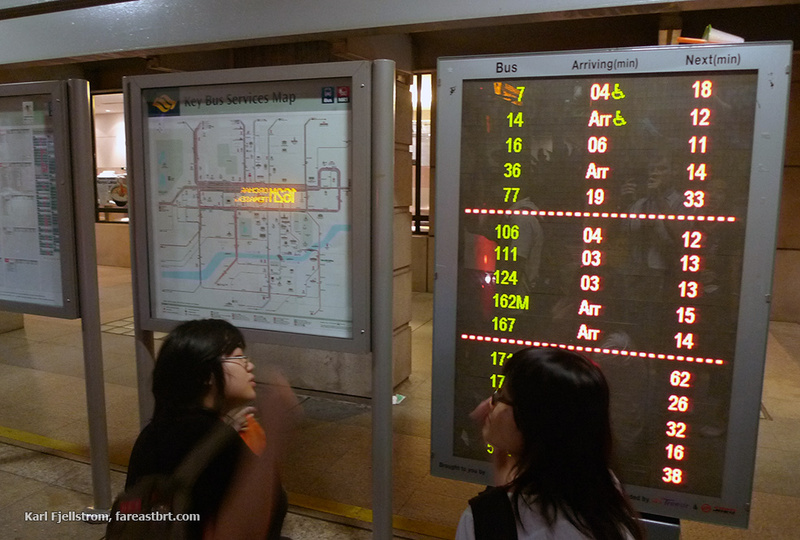 Passengers can also see at a glance useful information about bus arrivals. A passenger waiting for route 8 in the photos shown, for example, could see that there is a bus a few stops away, followed by another bus a dozen stops away. They could choose to do some shopping nearby and come back in time for the following bus in 10-15 minutes. For route 8, which averages only 1.5 buses per hour in the peak hour, or one bus every 40 minutes, this is extremely useful information. Without this real-time information about the following bus, a passenger would certainly not want to skip the next bus to do some last-minute shopping. If they skipped the next bus, they would risk having to wait 40 minutes or so for the following bus. It remains to be seen whether the financing model will ensure high quality operation and maintenance over a long period, whether locations with less advertising potential will be adequately covered, and whether the presentation of bus route information will be displayed prominently enough in relation to advertising. (The bus route information is currently shown too far below eye level for some routes.) Regardless, the Ji'an electronic displays show the way forward for real-time bus information, especially in BRT stations. BRT stations have power supply, security, and ample space for this kind of high quality passenger information which also provides important ancillary benefits by reducing bus bunching along a route. BRT and bus system control centres should focus more on providing their real-time information in a useful way to passengers. Singapore's bus stop signs in 2009 provided similar information showing the position of the next two buses for each route, showing the minutes to the next arriving bus, as well as to the following bus.